St. Thomas Academy players were decked out in impeccable suits and ties after each of their first two games as the state Class 1A tournament. They explained that each day’s excursion to the Xcel Energy Center was being treated as a business trip. On Saturday afternoon, they switched it up and went casual. “We closed the deal, and now I’m just so excited I don’t even want to take my jersey off,” said senior A.J. Reid, sporting his white No. 7 Cadets jersey. Reid chose puck marks over pinstripes after No. 1 ranked St. Thomas Academy beat No. 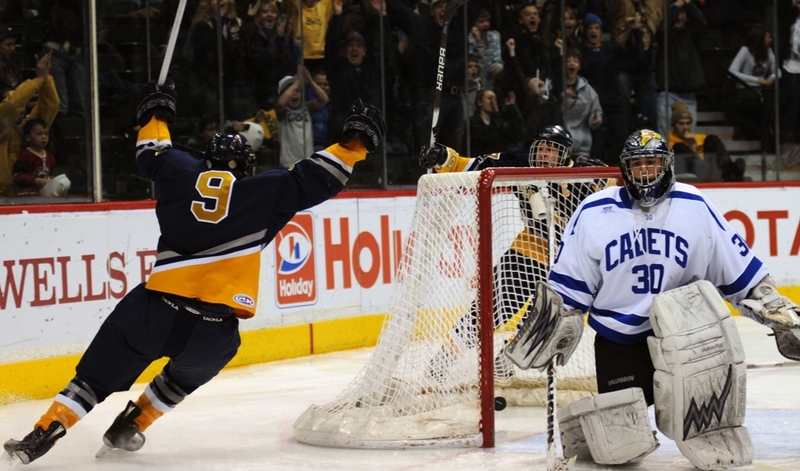 2 Hermantown 5-4 in overtime for the Cadets’ second state title in four years. 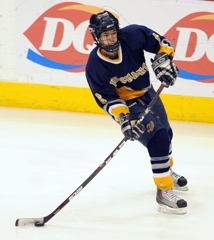 Reid was stationed in front of the Hermantown goal when St. Thomas Academy defenseman Taylor Fleming fired the decisive shot in the Cadets’ 5-4 overtime victory on Saturday, March 12, in St. Paul. The Cadets (25-6-0) rallied from a three-goal first-period deficit in large part because of the leadership of Reid and fellow senior Zach Schroeder. Andrew Commers pulled St. Thomas Academy to within 3-1 when he scored on a shorthanded breakaway with 26 seconds left in the first period. Commers was fueled in part by the calming influence of Schroeder, Reid, Fleming and the rest of the Cadets’ seniors. “Our senior leadership was telling the whole bench, ‘We’ve got this, boys. Just poise, poise – 3-0 we’ve done this before we can do it again. Just like Breck,’ ” Commers said. 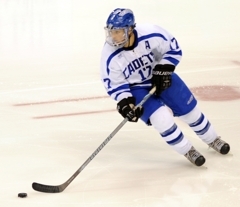 The Cadets rallied from a 4-2 third-period deficit to beat Breck on Jan. 22. 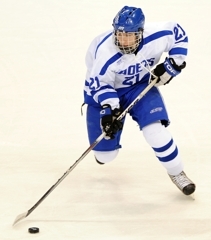 St. Thomas Academy also rallied to beat Rochester Lourdes in the regular season after trailing 3-1 and 5-3. Both Breck and Lourdes reached the state tournament. 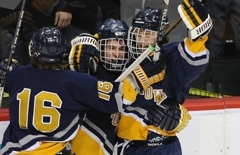 Hermantown (25-4-2) had surged to its 3-0 lead behind two goals from Jared Thomas and antoher from linemate Andrew Mattson. Reid backed his “we can do this” talk with action. He pulled the Cadets to within 4-3 when he scored with 2:03 left in the second. 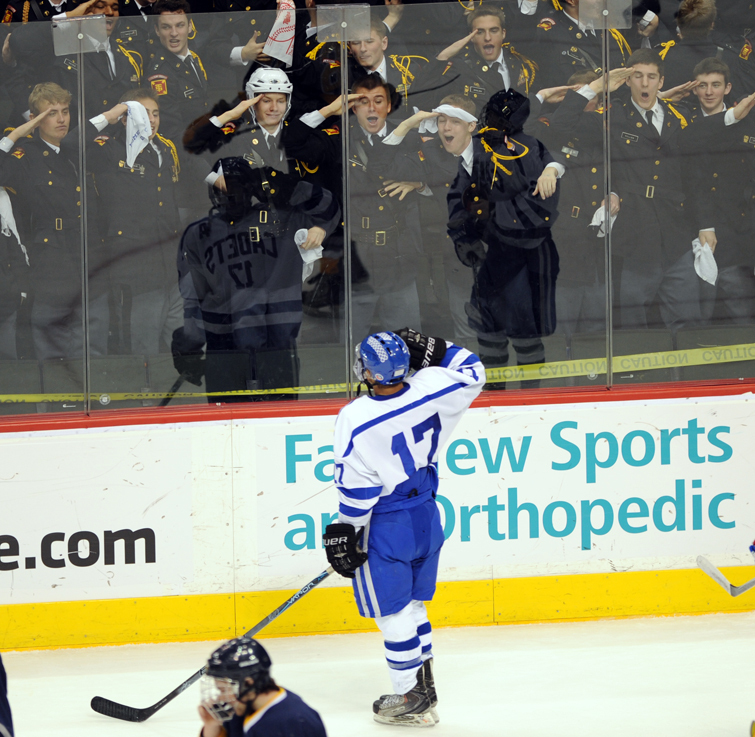 After the goal, Reid stood in front of the Cadets’ student section and gave a military salute. Commers scored again 4:43 into the third period. There was 1:26 left in overtime when Fleming scored to end it, touching off a wild celebration for a team that had lost to Mahtomedi in gut-wrenching fashion in the Section 4A championship each of the previous two seasons. After St. Thomas Academy celebrated its third Class 1A title in six years, senior forwards Zach Schroeder and A.J. Reid were named to the all-tournament team. Cheering for them off to the side was junior forward Andrew Commers -- who although also was deserving of the honor, scoring six points (five goals, one assist) in the state tournament -- was just happy for his teammates. 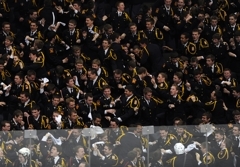 The most important thing for Commers, who plays on the Cadets’ second line, was what they had just accomplished together. Commers played a major role as ‘Mr. 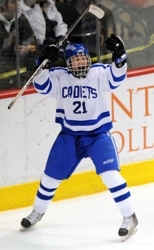 Clutch’ in St. Thomas Academy’s victory scoring two extremely crucial goals for the Cadets and assisting on another. With under one minute remaining in the first period and in the Cadets' staring out of a 3-0 hole, Commers was working on the penalty kill and received a big break. Commers deked and flipped a backhanded shot past Hermantown goaltender Connor Lucas with 26 seconds left in the period. “I think it was a big jump for fire for sure, but I think we could have gotten one early in the second period that would have given us that jump, too,” Commers said. It was no surprise the spark came from St. Thomas Academy’s second line. The Commers, Johnson and Krieger line had nine points in the state tournament (seven goals, two assists) with four of those points (three goals, one assist) coming in the state championship game. 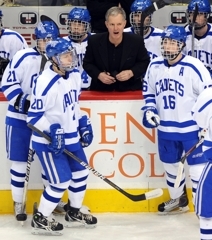 St. Thomas Academy coach Greg Vannelli was pleased with the production from the Cadets’ depth. Vannelli was quick to stress that depth is necessary to win a state championship. Added Commers: “All the dedication that we put into it throughout the whole year and finally we won it. 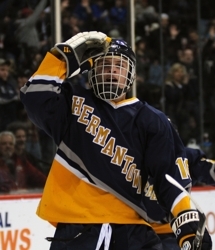 Heartbreak apparently comes in pairs for Hermantown. 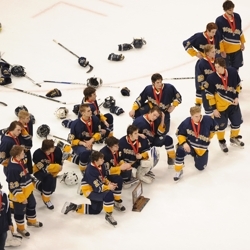 One year after losing the state Class 1A championship to Breck on a last-minute deflection, the Hawks again watched another team celebrate on the Xcel Energy Center ice in the season’s ultimate game. 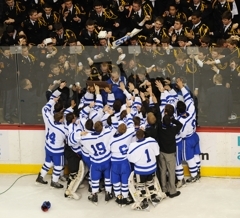 This time, it was an overtime seeing-eye goal from St. Thomas Academy defenseman Taylor Fleming that brought the Hawks to their knees – and to another heartbreaking runner-up trophy. Longtime Hawks’ coach Bruce Plante, who has a state championship to his credit in 2007, stood ashen-faced on the bench as the Cadets cleared their players’ box in celebration. “Why them? Why does that puck go in for them?” Plante said he was thinking as he watched his team drop to ice and exhaustion – and disappointment. Junior Jared Thomas, who had sprawled face-first on the ice in an attempt to block Fleming’s shot, buried his face in the ice, not wanting to believe what had just happened. He stayed down for several minutes as the Cadets’ yard sale continued around him. Unfortunately for Hawks’ players and fans, that’s exactly what happened. 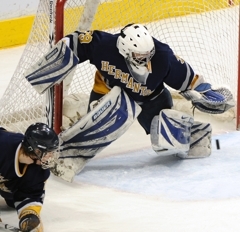 Last March, Hermantown was locked in a 1-1 tie with Breck into the final minutes of the Class 1A state championship game. The Hawks were outplaying the defending champions, but it went for naught when a seemingly harmless shot ricocheted off the shin pad of the Mustangs’ Mike Morin and into the net with 1 minute, 40 seconds remaining. Plante was disappointed, but attributed the bad bounce to puck luck and the whims of the hockey gods. One year later, with his Hawks in a state championship deadlock with top-ranked St. Thomas Academy, Plante had a nagging feeling he had seen this all before. 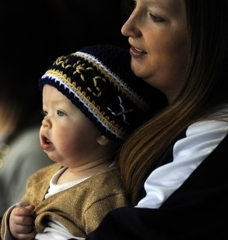 But would the hockey gods favor Hermantown this time? 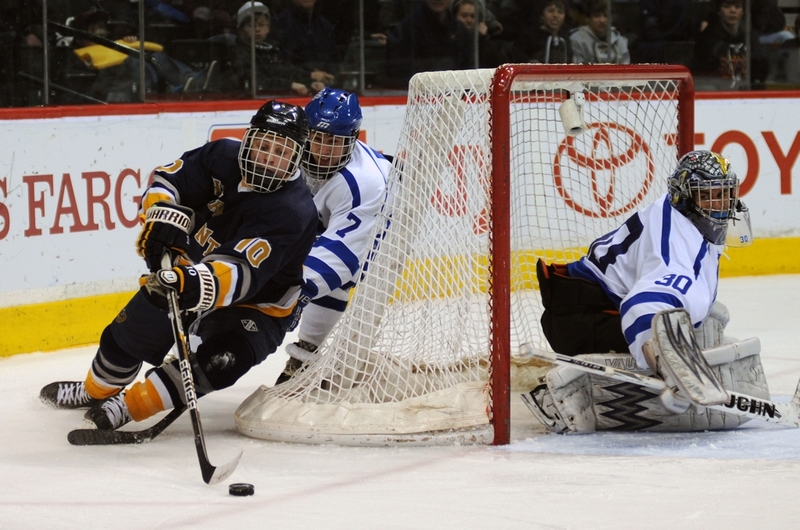 Instead, Fleming ripped a low shot through traffic that eluded goaltender Connor Lucas. Unlike last year’s Morin pinball, it was a clean shot through the Hawks’ heart. Yet it didn’t hurt any less. 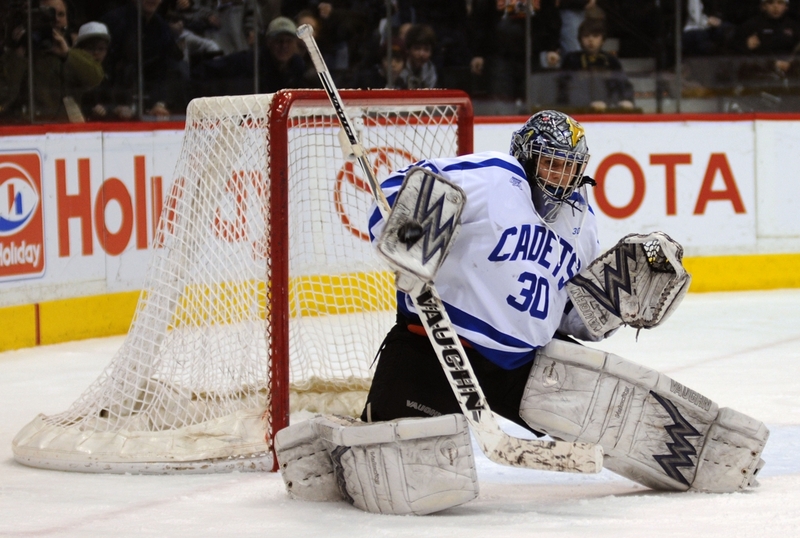 For Plante and the Hawks, it was another tough loss to a Twin Cities’ private school in a state championship game. 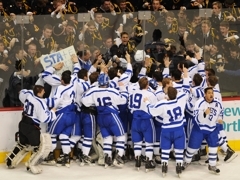 In the past six years, St. Thomas Academy has won three titles and Breck has claimed two. Only the Hawks in 2007 broke through that dominance. “I love our kids for doing it and you saw them battle out there. That’s a pretty big task for us to take that team on,” said Plante, who called the Cadets a Class 2A team playing Class 1A hockey. Taylor Fleming’s blood was on the ice - the result of a collision with Hermantown’s Garrett Skrbich that would later require three stitches. Throughout the course of the Class 1A state title game, Fleming would also leave plenty of his sweat at Xcel Energy Center. All that was left in overtime, one way or the other, were tears. Fleming made sure they were tears of joy, firing a low shot from the point that worked through traffic and found the back of the net with 1:26 remaining in the first extra session, sending No. 1-seeded St. Thomas Academy to their third state championship in six years. It felt like the Cadets were working overtime almost from the start. No. 2-seeded Hermantown led 3-0 barely 7 minutes into the game - a punch in the mouth, but hardly a knockout against a team with talent and composure to spare. Andrew Commers started the comeback with a short-handed goal with 26 seconds left in the first, while Peter Krieger made it 3-2 early in the second. Hermantown responded at 12:07, but Reid’s all-important answer three minutes later drew the Cadets within 4-3 at the second intermission. Commers brought the Cadets all the way back with his second goal, a sniper shot 4:43 into the third. 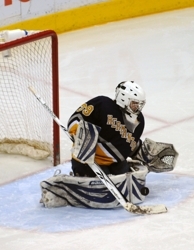 Hermantown regained composure and finished the third period strong but couldn’t put another puck past sophomore goalie David Zevnik, who finished with 29 saves. His work held up until Fleming ended things with a dramatic flourish. The effort required in the comeback that led to the ultimate celebration was not lost on the Cadets. The senior's shot from the point in overtime was waist high on and on goal, about all you can ask for from a defenseman. 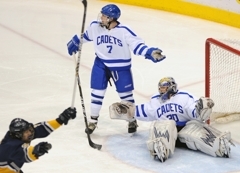 Of course, it went in as well, securing a state championship for the Cadets. Fleming also had an assist on the tying goal early in the third period and shared the team lead with seven shots on goal. Mark him down for one more "stat" -- three stitches to repair a gash above his nose. The second-line winger played the game of his career and then some, scoring twice and adding an assist. Commers’ goal on a shorthanded breakaway with 26 seconds left in the first period gave the Cadets life after a rough start had them facing the possibility of going into the first intermission trailing 3-0. Skrbich’s linemate, Andrew Mattson scored two goals in an outstanding performance for the Hawks, but it was Skrbich playing the role of setup man. He finished with three assists and used his mix of speed, muscle and hustle to generate scoring chances shift after shift.